As you can see from my Headlines that yes, my Husband actually said yes to salad for dinner. This is the meat and potatoes guy! You know the one! The one that says no thanks, I’ll stop at Subway on the way home and pick up a double meat Steak Sub with lots of mayo. Well my Friends, the other night I called Hubby and said, do you want a Chinese Chicken Salad for dinner, and he said ok. I swear if I weren’t siting down, I would have fell down! I even told Little Jenny, and she said what? Did he understand you? That must me a mistake. No mistake, he said YES! But the question is, did he eat it? The answer is YES! He ate it all and even said, you ready for this? He said that it was good! What? You ate salad and liked it? Am I changing my man? What does he want from me? Am I on candid camera? This has to be a joke? No joke! He actually liked it and even said the dressing is good. What the? I tell you, I was in a total shock! Most men, I think, eat whatever there wives serve them, but not my Hubby, he says he’s not hungry and eats a bag of potato chips. He can’t fool me, he just doesn’t like healthy food, but he liked the salad. To boot it was Chinese, he doesn’t like Chinese except for PF Changs. Total shocker, I tell ya! Even as I write this I am in disbelief. So what is in this salad that made my Husband like it? Lots of good healthy things! 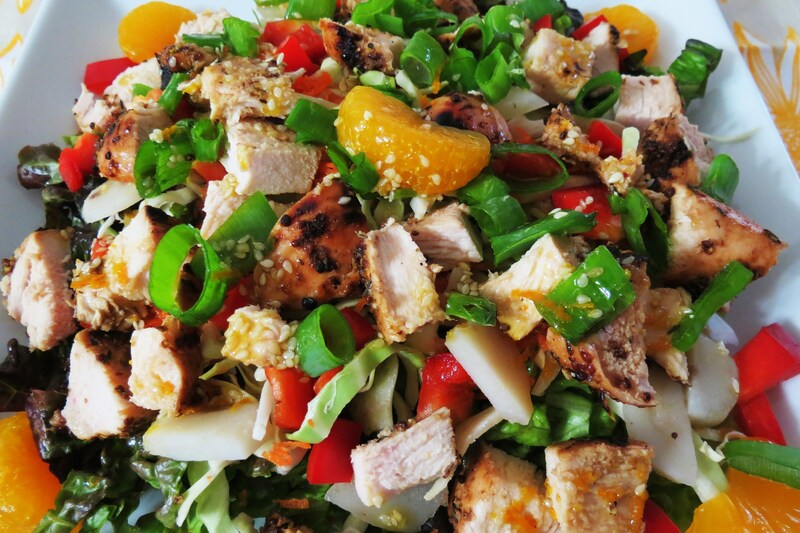 You have some sweet mandarin oranges, crispy water chestnuts, scallions, cabbage, bell pepper and chicken. Now my Friends at the Holiday Recipe Club are thinking, girl, none of those items are on our holiday list of ingredients. Be patient my Dears, it’s right here. 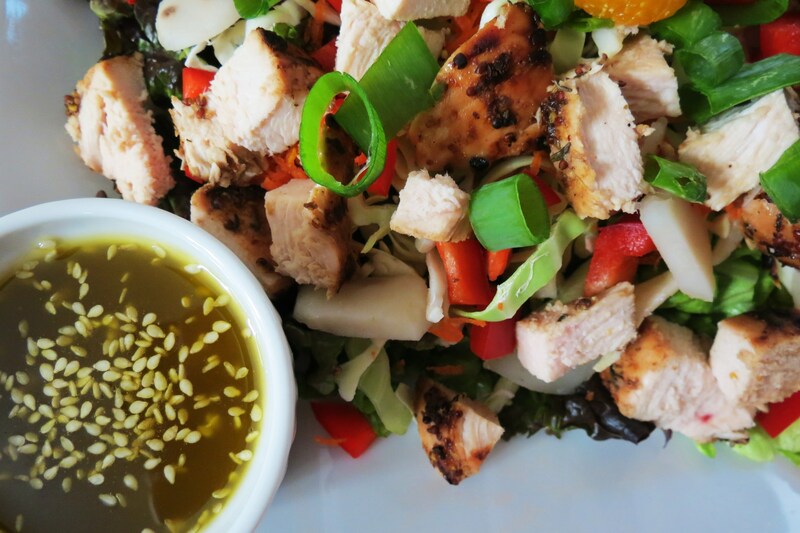 A sweet and little savory sesame dressing accompanied my Chinese Chicken Salad. This recipe is part of the Hoilday Recipe Club hosted by Erin from Big Fat Baker. We had three items to choose from gram masala, tofu, and sesame. I chose Sesame. To be honest I don’t’ care for tofu and I have no clue on how to use gram masala or even sure what it is. My guess is that it’s a spice. I can’t wait to see what recipes others posted and hope someone chose that ingredient. 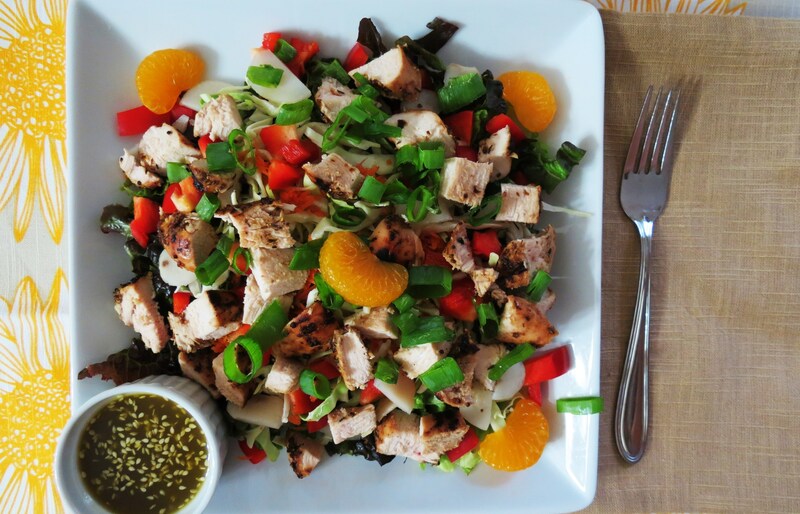 The dressing was a perfect with this salad. It’s made with fresh oranges, soy sauce, honey, orange zest and toasted sesame seeds. I really enjoyed the orange and honey flavor of the dressing and how it combined nicely with the cabbage and sweet peppers. I loved this salad so much I ate it two days in a row. It’s so good and so healthy!!! Yes I said healthy and my Hubby liked it and he liked the dressing. I know I’m still talking about this, but come on, it’s big news in my household! 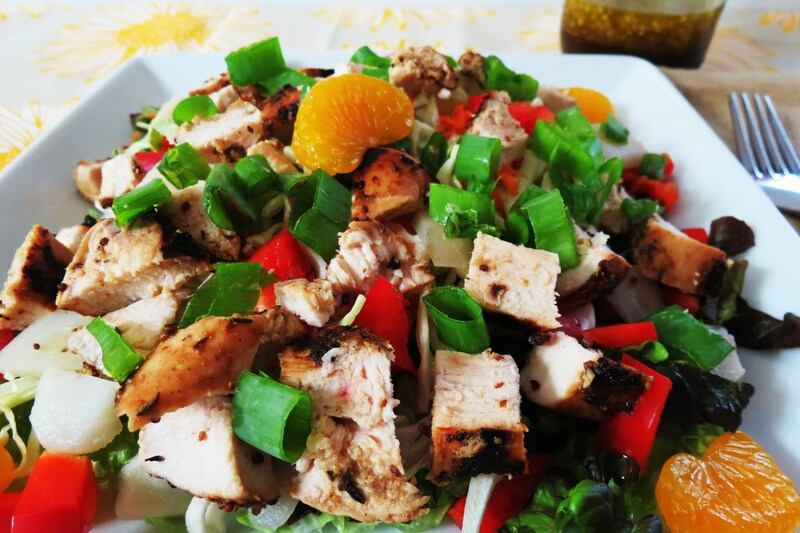 A healthy salad made with fresh vegetables and fruit that is served with a sweet Sesame dressing made with fresh oranges and organic honey. 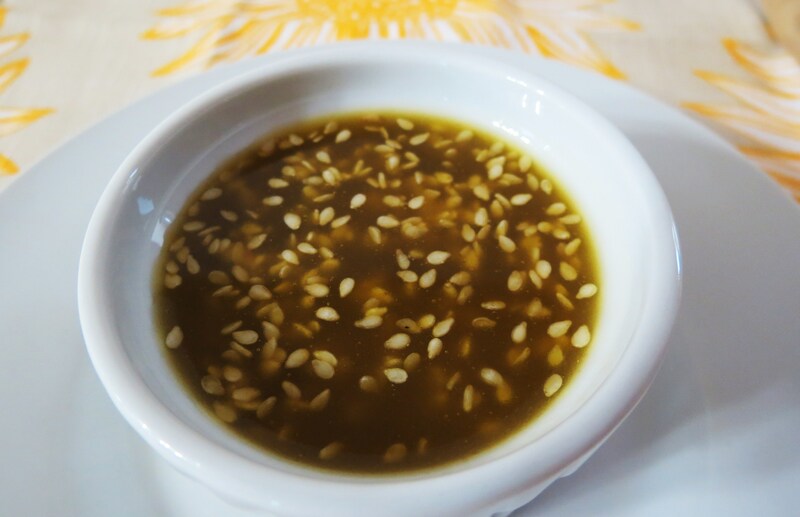 To toast Sesame Seeds, I put them in a small frying pan, turn the heat to medium and cooked sauteed them for a few minutes, until lightly golden and fragrant. In a glass bowl whisk together vinegar's, orange juice, orange zest, honey, soy sauce and sesame oil. Add Olive Oil mixing while pouring a steady stream. Add salt & pepper to taste. Mix in sesame seeds. I have also made this salad with Shrimp too! It’s just a wonderful, light, crunchy salad with the most unbelievable flavors. I grilled my chicken, but in the past or on short notice I have used a Rotisserie Chicken to top my salad. I love short-cuts. 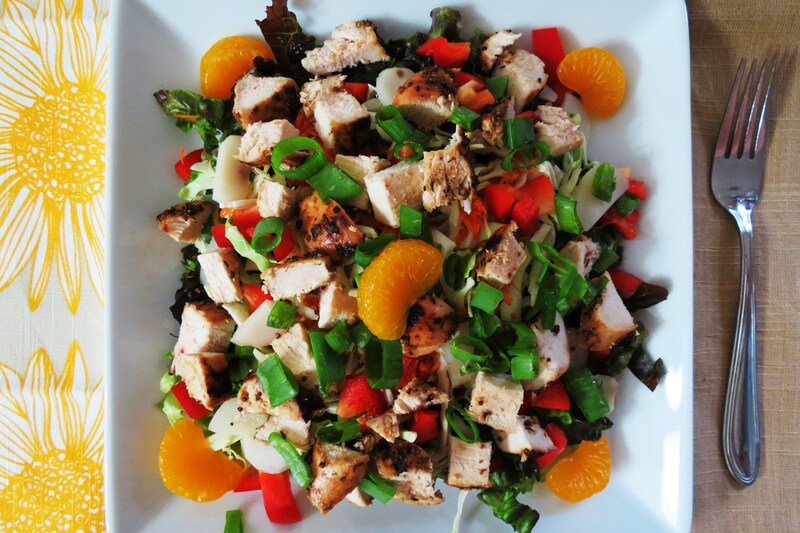 To be honest this salad takes about 20 minutes to make and that’s cooking your chicken on the grill. I marinated my chicken for a little bit, and threw it on the grill, but I’ll share that secret recipe with you later. If your interested in joining the Holiday Recipe Club you can go here to sign up. It’s a lot of fun and I am so happy to be apart of this group. I love to come up with new and creative recipes with the secret ingredients they pick! So check it out and sign up. Now be sure to check out all the other recipes that everyone posted! I’ll be sure to stop by everyone of them! Thanks for having me!! I love all fun ingredients you pick! Still working on my next Holiday Recipe Club recipe. Have a wonderful weekend! I can’t wait to make this! Your site is awesome!!! Ahhh thanks Beth! 🙂 If you make it, let me know what you think!! I always love feedback. Sorry for my first comment intrusion, lol, but we’re friends on FoodBuzz and saw your blog post in my feed. I’m laughing so much at your title. Seriously, this sounds exactly like my household. Gotta’ love a good old salad every once in a while but nope! How could he say no to your salad. It’s the best looking salad I’ve seen in my life! Very nice. Great recipe, thanks for sharing. Hi Lisa, No intrusion! Stop by any time! Thank you for the Buzz and the compliment. 🙂 I have to say I enjoyed writing this post. My Hubby will be reading it when he gets to work. I can just see him now shaking his head. he he Have a great day!! Now that is a salad! Love the dressing. 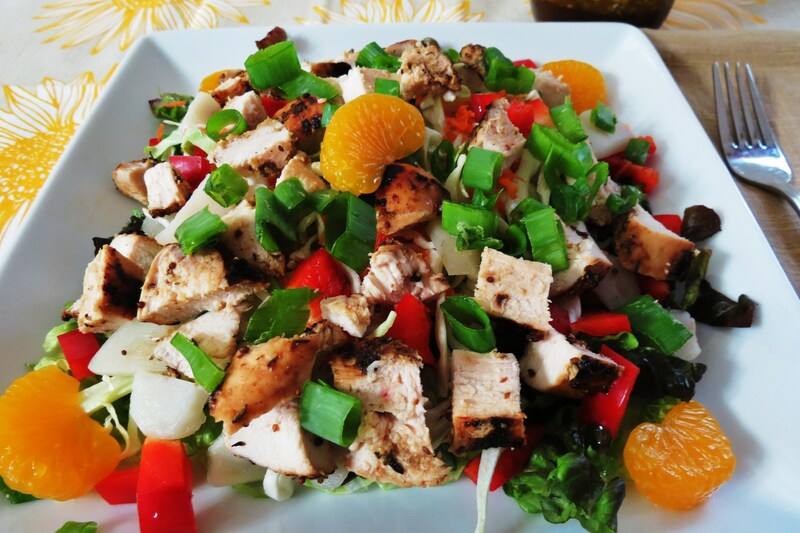 There is so much chicken and “stuff” on that salad, I think my hubby might actually like it! This is a pretty full salad, but it’s light enough not to be heavy. I was really shocked my Husband liked it. I’m with hubby. I’d tear this up! YUM! I tore this salad up and liked it so much I had it the next day!! Have a great day!! This looks extremely delicious. I am always looking for a good oriental salad dressing. I like the entire ingredient list – can’t wait to try it! Buzzed it up and saved it to my favorites! Thanks for the buzz! If you try it let me know what you think!! Have a great day! What a colorful and yummy looking salad. My husband likes salads (we have salad night a lot) and I will have to add this to the rotation. Thanks! I cracked up at your title. I can see why he said Yes! That salad is meat and potatoes type of salad…looks super satisfying. I love all the flavors! What a beautiful salad with all the colors and textures – no wonder he loved it. The dressing sounds great too. Congratulations on making the Foodbuzz Top 9! It looks delicious! Wow this salad sounds so fresh & delicious! Perfect for spring & summer! How could your hubby ever resist!? I’m so glad your husband said yes or you might not have shared this wonderful salad with us! 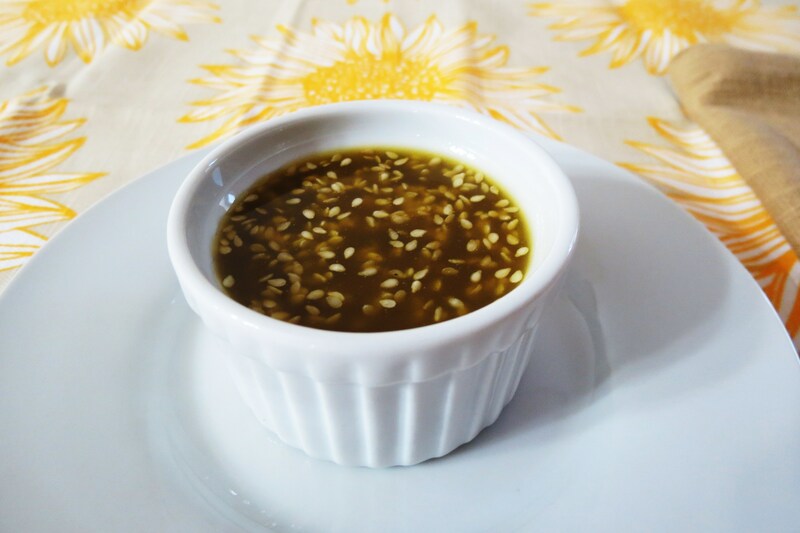 This looks delicious and I love the sesame dressing!